What type of mic do I need? Should I get a wireless mic? What About Solos & Duos? Delivery is £5 per order under �100 and free over �100 regardless of the number of items. Delivery is usually 1-2 working days. Hearing loops allow people who use hearing aids to pick up sound directly from a microphone or PA via the "T" setting on their hearing aid. This is particularly useful in meeting room environments. There are two basic components. Firstly. the loop itself - a thin wire which runs around the perimeter of the area where the hearing aid listeners will be. The wire must be run on a level plane in order to generate the required magnetic field and can be under the flooring or above the doors. It doesn't need to go around the whole room, just the area where the people needing to hear usually sit or stand. E.g. it doesn't have to go around the whole of a Church, just the area where the Pews are and perhaps also the Font. The loop plugs into the second component, a 'loop amplifier'. Microphones can be plugged directly into the loop amplifier or you can take a feed directly out from your PA system via the PA's aux out socket. This is the best way to get the right balance between people listening directly to the PA and using their hearing aids. When in use, the hearing aids are simply switched to the 'T' setting and the users hear both speech and music with crystal clarity, as though they were wearing headphones plugged in to a Hi Fi system. Smaller loops are available for office or desk situations, and personal loops are also available for a person to wear around their neck. Prior to installation, it is important to check if there will be any equipment in the vicinity that may interfere with the loop's magnetic field, such as large transformers, high power cables or substations. It is also important to ensure that no equipment will be adversely affected by the loop field, such as sensitive data or signal cables. In these cases, it may not be possible to cover some or any of the required area with an induction loop. The cable gauge will depend upon the total length of the induction loop. Usually, the loop will be installed around the perimeter of the listening area. However, there are various techniques which can be employed to build arrays to vary the shape and strength of the field. In general, calculations outlined here are based upon a perimeter installation. It is recommended to use good quality insulated pure copper cable for the induction loop. The cable gauge used will need to be determined by the total length of the cable run. As a quick reference, refer to the table below. The wire may be run in plastic conduit but not in any metal containment so as not to impair the magnetic flux. The ideal height to install the cable depends upon the width of the loop (i.e. the narrowest dimension relative to the listener). The optimum output will be achieved if the cable is installed 14% of the loop width higher or lower than the plane of listening (ear height). In practical terms, the loop is usually installed onto skirting boards, under flooring or at ceiling height so that it is unobtrusive. It is recommended to avoid varying height levels as much as possible to avoid anomalies in field strength. For irregular shaped areas or larger than the loop amplifier's capacity, multiple induction loops may be required for coverage. Connecting further loop amplifiers using the Slave connection (if present) will enable multiple loops to be used together. Further installation advice is available in the product manual. 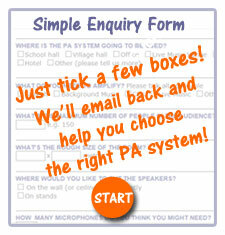 If you need a Hearing Loop system please give us a call on 01375 892317 or email enquiries@whatpa.co.uk as not all products are shown on our website at present.